Dr. Richards' Little Fans! Enjoy this new Little story! Gritting her teeth at the pain in her hand and shoulder, Fiona gingerly tried to lift most of the boxes with her left hand by wedging them against her stomach and using her whole body to shift the weight. The pain was getting worse. She’d replaced her right glove on her hand but now it was skin tight around her swollen flesh. Fiona peeled it from her hand wincing as her injured hand She knew that she’d never be able to pull it back on again. Against her best efforts, Fiona felt tears run down her cheeks. Once the cart was loaded, she wiped the tears away and pulled down the bill of her cap to hide her blotchy face. Using her body and her left hand, she pushed the laden cart to the door and pressed the delivery button. When the door opened, she said a cheerful “Hello!” and handed over the clipboard for the employee’s signature. Fiona pushed the cart inside as he stepped back from the door. “I’ve got everything your boss ordered, Pierre. The chanterelle mushrooms are beautiful,” she said quickly as she began to unload the cart trying to disguise her injury. As she turned to set the first crate down, she saw the toes of the distinctive boots that Georges wore. She swallowed loudly. “Sorry, Chef. I wasn’t expecting you. I’ll get the rest of this cart unloaded and get out of your way. I know you’re super busy.” She kept her head down to hide her tearstained face. “Of all the days to get to end up face to face with Georges! I can’t even lift my eyes to see his handsome face,” she berated herself. Fiona continued to unload the cart biting her lip to avoid making any moans of pain as she used her right hand as little as possible. She could hear him rifling through the order sheets and comparing them to the boxes. Finally, she heard the scratching of the pen on the paper. She reached her right hand out automatically to accept it back as he handed it to her, forgetting her injury. A low, visceral moan of agony escaped from her lips as he pushed it roughly into her hand. Immediately, tears welled in her eyes and she began apologizing to cover the sound. “Sorry! I’ll just get these last boxes unloaded, Chef.” She turned to the cart and started to pick up the last box. Her eyes flew to his handsome face as he quickly lifted it for her and placed it on the floor before turning to face her. Georges has been searching for his Little girl for many years. It is quite a surprise to find that she has been hidden right under his nose! Some of the characters from the first sixteen novels in this series reappear to continue their stories. You do not need to read the stories in order. The books do not necessarily take place in chronological order. All are complete stories. The Dr. Richards' Little books will feature invasive medical treatments, including thorough examinations and enemas when required, as well as diaper changes, spankings and other punishments. If you are offended by age play (adults who choose to live as a Little or a parent of a Little), or dubious consent, this is not the book for you. 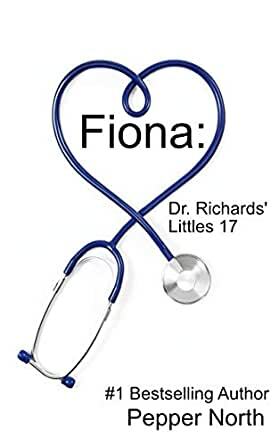 Fiona - I love all of the Dr Richard's Littles books and I can never pick one favourite as I love them all for different reasons. This series is amazing and Pepper is always willing to chat and let you know what she is up to... she's been teasing hints about Fiona for a while and now that I have read it I have to say she is definitley on my re-read list along with the rest of this series. If you like age play, especially no hold barred age play check out not only this book but the entire series! whats not to like when reading a good Dr Richards littles book. If you havnt read any of these before im really sure you will love these. The littles are usually down on their luck and their Daddies are so awesome that sometimes you wonder what it will really like to be treated like this in the Real world. You will love Fionas story. i wont give away any spoilers as its worth just reading to find out what happens to this little. Fiona delivers produce to restaurants and was injured on the job. Georges, a chef, noticed how much pain she was in when making his delivery and is concerned for her. He begins to think she could be the Little he's been searching for and asks that she call him if she needs help. Their relationship begins and grows while he takes care of Fiona. I enjoyed reading this book. Wow, loved this book, cried when Fiona got hurt & she wasn't going to go to the Drs. but her boss made her, & then found her Daddy at her last delivery stop. Wonderful! One of my favorite series! I am always looking for the next book! If you are not ageplay, this is a wonderful series that is not just Daddy/little girl. There is a variety of books, it's not a one size fits all! I would recommend this to anyone who likes to read age play.